Bring elegance to your home with this unique and stylish rug crafted of Viscose and Cotton blend. Made of Cotton and viscose Ryon. This fashionable rug is known for its plush border and patchwork design. Soft velour finish in center and Plush Rug Border on the side. Decorative and water-absorbent, this combination is sure to add a pleasing touch to your home decor. 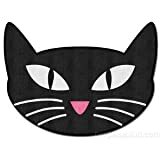 There’s nothing like a Black Cat Throw Rug to really tie a room together. 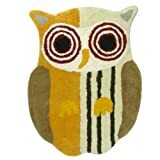 Hoot cotton bath rug adds fun to any bathroom. Has a Latex back for non skid protection.